Not all gold dividend stocks are safe and secure, but these five gold stocks stand out in the crowd. Find out why. Not many commodity stocks offer dividends, but gold stocks have been an exception. Most gold stocks pay a dividend today, which is commendable given how closely miners' profits are tied to unpredictable gold prices. For investors, regular dividends can help balance some of the volatility that comes with investing in gold stocks. *Data as of April 23, 2017. Source: Google Finance. As tempting as high dividend yields can be, I believe stability and security of dividends are far more important for investors in gold stocks. With that in mind, here are the top five gold dividend stocks to buy today. It isn't hard to find good gold dividend stocks. Image source: Getty Images. Royal Gold is one of the best gold dividend stocks you can find today, thanks to its 16-year record of dividend increases. Credit goes to its business model: Royal Gold isn't a miner, but a streaming company that finances miners up front and buys metal streams at low prices in return. That's a win-win as Royal Gold doesn't have to spend boatloads of money extracting metals and can secure metals at low prices. For example, its cost of sales was only about 20% its revenue, and operating margin was nearly 34% during the six months ended Dec. 31, 2016. Not surprisingly, Royal Gold's cash flow has grown steadily over the years regardless of gold prices, rewarding shareholders richly. The company has increased dividends every year since 2000, at a compounded annual clip of 20%. That's the best dividend record among streaming companies. With Royal Gold poised to deliver another strong year and management keen on paying out a "growing and sustainable dividend," income investors can safely trust this gold stock. Dividends from streaming companies are usually safer than those from miners, which is why I'm adding another gold streaming stock to this list. 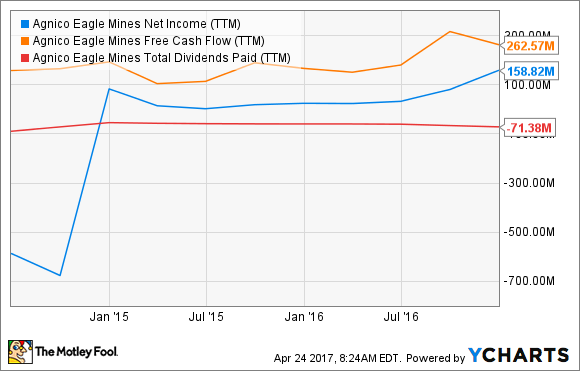 Franco-Nevada's dividend history might not be as strong as Royal Gold's, but its dividends have great growth potential. Franco-Nevada boasts nine consecutive years of dividend increases thanks to rapidly growing profits and cash flows backed by a diversified portfolio: Unlike any other gold company, Franco-Nevada also deals in platinum group metals, as well as oil and gas. After a record fiscal year 2016, Franco-Nevada projects its gold equivalent ounces production to rise roughly 14% by 2021 thanks to several newly acquired streams. That aside, the company is also investing in oil and gas royalties to gain significant exposure to active oil counties in the U.S., so much so that it believes its oil and gas revenue could triple in the next decade. Those numbers tell me Franco-Nevada's dividend streak is unlikely to break anytime soon. Agnico Eagle's dividends might have been wobbly, but the miner hasn't missed a dividend since 1983, and it increased its dividends by 25% last year. There's tremendous scope for Agnico to boost its dividends further given the small portion of free cash flow it's paying out currently. AEM Net Income (TTM) data by YCharts. Until now, Agnico prioritized deleveraging and growth projects over dividends, which is a prudent call on management's part. Last year, Agnico's production exceeded estimates; and it cut down debt, boosted cash from operations by nearly 26%, and brought down its all-in sustaining cost (AISC) to a competitive level of $824 per ounce. Agnico also struck gold at its Meliadine and Meadowbank mines, and hopes to increase its total gold production by 20% by 2020. Having come off such a strong year, Agnico is now better poised than ever to grow its cash flow and dividends. Unlike other gold dividend stocks, Newmont has a dividend policy that offers unique security to gold investors. 2016 was a remarkable year as Newmont lowered its AISC for the fourth consecutive year, trimmed debt by almost one-third, and more than doubled its free cash flow. Encouraged, management revised its dividend policy in a great shareholder-friendly move, outlining a quarterly dividend payment based on the average quarterly London Bullion Market Association (LBMA) P.M. gold price, with minimum annual dividend set at $0.10 per share for gold prices below $1,150 per ounce. The company has fixed dividend amounts for a range of gold price points. Image source: Newmont Mining's investor presentation. Such a policy means investors are not only assured of dividends, but can predict the amount. That's as good as it can get for income investors in a commoditized business. Barrick's dividend record is least impressive of all, with its dividends declining substantially since 2012 and a massive 50% cut in 2015 alone. So why, you may ask, do I consider Barrick as a top gold dividend stock? The answer is not in the past, but in what lies ahead. Barrick sprang a big surprise earlier this year by increasing its dividends by 50%. Coming after a long hiatus, the dividend boost indicates that Barrick is finally strong enough to return greater value to shareholders. And why not? Barrick had a transformational 2016 as it slashed AISC to an industry low of $730 per ounce, cut debt by $2 billion, and generated record $1.5 billion in free cash flow. With Barrick making some big growth moves lately, aiming to remain free-cash-flow positive at $1,000 per ounce of gold, and targeting AISC of $700 an ounce by 2019, investors can expect generous dividends going forward as the miner's cash flow grows.